Note : For15 years old and above. With 2018 almost coming to a close and winters knocking on the door, the celebration season has finally kicked-in. If you crave for weekends and can’t help but grove to tracks like Lean On, Where Are U Now and Hey Baby, we have a good news for you! This weekend just got bigger with the man himself performing live in your city. Yes, you read that right. 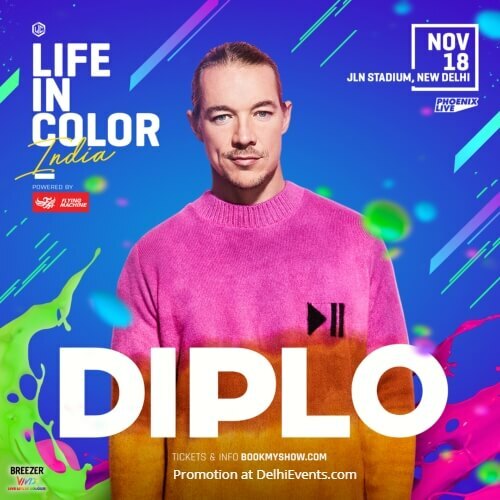 Performing for the debut show of Life In Colour in India, Diplo is all set to take New Delhi by storm on November 18. If this has already compelled you to call your friends and book your tickets, what if we tell you that this is not all? Life In Colour’s Delhi edition will also have an enviable line-up of artists like Divine, Ritviz, 4B and Smokey. To add to it, what’s more than dancing to the world’s most popular DJs is that the concert will also feature soaring aerial acts, stilt walkers and contortionists. This November, it is traveling to India for the very first time to mesmerise the audience. Life In Color is more than just an EDM concert, it’s the world’s largest paint party! Sounds like a perfect recipe to light up your weekend, doesn’t it?